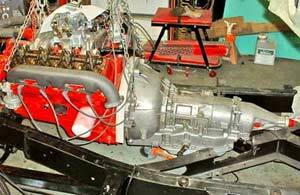 While enjoying the successful outcome of our work on the new front suspension on our '55 T-Bird car restoration project, we elected to mount the rebuilt engine and new AOD transmission onto the frame. 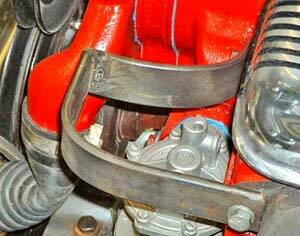 In addition, we would need to create brackets for the A/C compressor and alternator, create a rear transmission mount in the old frame, and run cooling lines to an outside transmission oil cooler. Once all that was done we would be able to get the engine running and sort out the TV (throttle cable) adjustments for the AOD. Meanwhile, our drive shaft was being converted to the new length and U-joint configuration we would need. 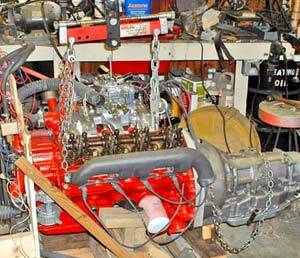 It had to be lengthened one inch, and the transmission yoke needed to fit the AOD. We gave this job to an experienced shop that makes drive shafts for drag racers. They have the equipment to keep the two new pieces of shaft in perfect alignment and balanced. This is just not worth trying to do yourself unless you own a machine shop. 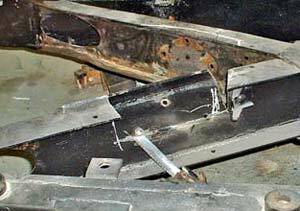 Since we had meticulously measured the original location of the front engine mount and re-welded it to the new sub-frame, we knew we had a reference for everything else. However, we would have to not only lower the engine/transmission assembly into place but also angle it the correct amount from vertical — approximately 4 degrees to the rear. It pays to make sure the engine is lifting level and nothing is in the way. The first thing to do was to get the assembly lifted off the test stand dolly with the crane.Next, we positioned the assembly over the frame and started to gently lower it into place.We guided the mating points for the front engine mount and let it down slowly. Patience! Patience! Moving too fast here cause great damage. We couldn't lower the engine far enough to set its proper angle, since the bottom of the transmission hit the center X-portion of the car's frame. We made some measurements of how much we'd have to cut out and then cranked up the Sawzall. The only difficulty at this point was overcoming the fear of chopping up the center structure of the frame. Now that the engine could be angled properly, we strung a plumb line in front of the pulley and measured the proper angle from it, dropping the rear portion of the assembly into the new cavity in the frame. How did we know the proper angle in the first place, you might ask? Well, we consulted our photos and the factory drawings that we had blown up in size and mounted in the shop. Chalk makes a great marker for cutting. To create the mount, we realized immediately that we could use the old cross member that had held the original transmission. All we'd need to do is relocate it forward and down in the frame, allowing for the new rubber mount (we'd purchased one at the local parts store, choosing a mount that would fit from their catalog.) We welded the cross member into place and installed the new mount. It's in place and ready for creating the new transmission mount. Since we had cut half of the frame's X-member out, the original structural integrity was compromised. To cure this problem we trimmed the cut-out pieces to fit the clearance under the transmission's tail housing and then welded them back into place. 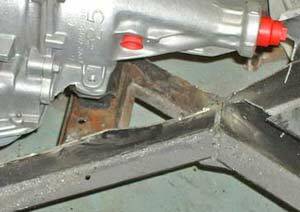 We then used angle iron to stiffen the frame voids. After grinding the welds and cleaning the metal, we painted the area. The new cross member has been fitted into place. 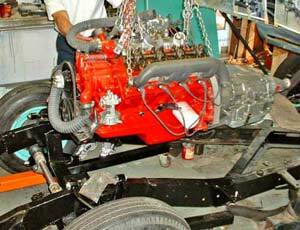 The engine/transmission assembly was then lowered into place and the mounting hardware installed. 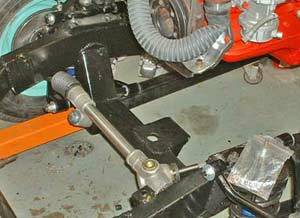 The newly-modified drive shaft was inserted into the tail shaft and fastened to the differential yoke. 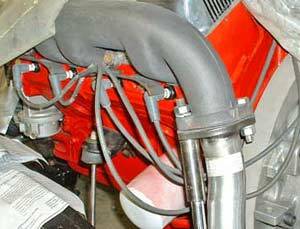 Since we had new exhaust components (and we wanted to run the engine later to set up the transmission) we installed the "down-pipes" and mufflers, just clamping them tight enough for test-running. Now all we need to do is fill the void in the frame that was made to clear the pan. We decided to put the A/C compressor on the right side of the engine, for several good reasons. The most open space was on that side, which would give us lots of flexibility in mounting the lines. Also, the heavier compressor would offset the weight of the battery (driver's side), and routing the lines into the firewall would be much less complicated. Lastly, the old generator bracket fit there originally. The generator bracket looked like it could be modified to take the compressor. In fact, no modification was needed to the bracket itself, only to the "ears" on the compressor. We drilled them out larger, inserted a long threaded bolt into the bracket and were able to mount the compressor easily. The only thing required was a shim to move the pulley in line with the crankshaft pulley. Looks like Ford put it there in 1955. 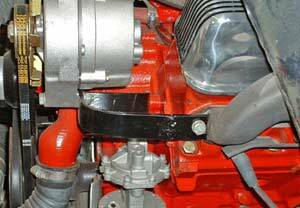 We fashioned a belt tensioner plate from some scrap pieces and drilled it to fit its mounting bolt in the block. Everything fit perfectly. 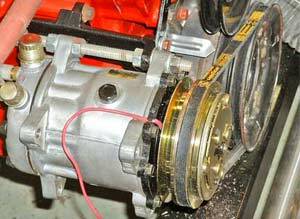 Next, we turned our attention to the alternator. The only available place to mount it was over the fuel pump, so we would have to manufacture a bracket. We wanted to make a rigid bracket that wouldn't flex under the load and vibration of the alternator. A piece of 1/4 inch flat steel proved to be the best material on hand, so we heated it with the torch and bent it to fit, then welded an extension to it. Holes were drilled in the two ends and we mounted the bracket to the engine block. 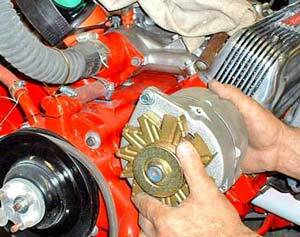 Mounting the alternator to it was simply a matter of drilling holes in the appropriate spot. While it looks simple, the bracket took 2 hours to create. 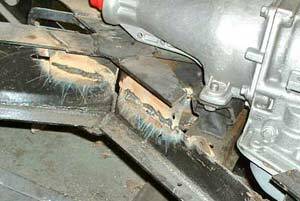 To provide an adjusting bracket for the alternator we welded an extension onto the original one so that it could reach a suitable mounting bolt. This turned out to work quite well. The next step was to select belts for the A/C and alternator. Once we had chosen these we made sure to note the part numbers in our shop manual so replacements will be easy to get. After powder coating, the new bracket and alternator are in place.